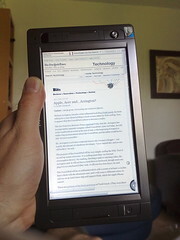 Reading about the crunchpad on my own pad. It’s a viliv x70 and is going on sale on 6th of july. See umpcportal.com/tag/x70 for info.